Ranked 10th in the U.S. The most recent earthquake in Ohio of any appreciable magnitude occurred on December 31, 2011, at 3:05pm EST. It had a magnitude of 4.0, and its epicenter was located approximately 4 kilometres northwest of Youngstown (41°7′19.1994″N 80°41′2.3994″W﻿ / ﻿41.121999833, -80.683999833), near the Trumbull/Mahoning county border. From just over 45,000 residents in 1800, Ohio's population grew at rates of over 10% per decade until the 1970 census, which recorded just over 10.65 million Ohioans. Growth then slowed for the next four decades. The United States Census Bureau estimates that the population of Ohio was 11,594,163 on July 1, 2014, a 0.5% increase since the 2010 United States Census. Ohio's population growth lags that of the entire United States, and Caucasians are found in a greater density than the United States average. As of 2000, Ohio's center of population is located in Morrow County, in the county seat of Mount Gilead. This is approximately 6,346 feet (1,934 m) south and west of Ohio's population center in 1990. As of 2008, Ohio's voter demographic leans towards the Democratic Party. An estimated 2,408,178 Ohioans are registered to vote as Democrats, while 1,471,465 Ohioans are registered to vote as Republicans. These are changes from 2004 of 72% and 32%, respectively, and Democrats have registered over 1,000,000 new Ohioans since 2004. Unaffiliated voters have an attrition of 15% since 2004, losing an estimated 718,000 of their kind. The total now rests at 4,057,518 Ohioans. In total, there are 7,937,161 Ohioans registered to vote. In the United States presidential election of 2008, then-Senator Barack Obama of Illinois won 51.50% of Ohio's popular vote, 4.59% more than his nearest rival, Senator John McCain of Arizona. However, Obama won only 22 of Ohio's 88 counties. Since 2010, the Republicans have largely controlled Ohio state politics, including a super-majority in the state's House, a majority in the state Senate, the Governorship, etc. As of 2014, the state Senate is 1 Republican away from a super-majority. ^ a b "Why is Ohio known as the Buckeye State and why are Ohioans known as Buckeyes?" (PDF). http://www.dnr.state.oh.us/Portals/18/education/pdf/buckeyestate.pdf. Retrieved April 21, 2008. ^ "Ohio Quick Facts". Ohio Historical Society. http://www.ohiohistorycentral.org/ohio_quick_facts.php. Retrieved March 26, 2009. ^ a b "City of Columbus: Fun Facts". City of Columbus, Ohio. 2006. http://home.columbus.gov/GenInfo/index.asp. Retrieved March 26, 2009. ^ According to the U.S. Census July 2013 Annual Estimate, Greater Cleveland is the largest Metropolitan Statistical Area (MSA) that is entirely within Ohio, with a population of 2,064,725; and Greater Cincinnati is the largest MSA that is at least partially within Ohio, with a population of 2,137,406, approximately 25% of which is in Indiana or Kentucky. Which MSA is the largest in Ohio depends on the context. ^ a b "Table 1. Annual Estimates of the Resident Population for the United States, Regions, States, and Puerto Rico: April 1, 2010 to July 1, 2014" (CSV). U.S. Census Bureau. December 27, 2014. http://www.census.gov/popest/data/state/totals/2014/tables/NST-EST2014-01.csv. Retrieved December 27, 2014. ^ a b Mary Stockwell. Ohio Adventure. Gibbs Smith. p. 88. ISBN 978-1-4236-2382-3. http://books.google.com/books?id=VJKroULBUpgC. ^ "Creation of the Board of Elections". Mahoning County Board of Elections. http://www.mahoningcountyoh.gov/DepartmentsAgencies/Departments/BoardofElections/CreationofBOE/tabid/821/Default.aspx. Retrieved March 25, 2009. ^ a b "The Governors of Ohio". Ohio Historical Society. January 8, 2007. http://www.ohiohistory.org/onlinedoc/ohgovernment/governors/. Retrieved March 25, 2009. ^ Hershey, William (November 8, 2006). "Strickland becomes first Dem governor since '91". Middletown Journal. http://www.middletownjournal.com/hp/content/oh/story/news/local/2006/11/08/ddn110806gov.html. Retrieved March 25, 2009. ^ "About Lee". Office of the Governor. 2009. http://www.governor.ohio.gov/AboutUs/AboutLee/tabid/57/Default.aspx. Retrieved March 25, 2009. ^ "Democrats Jennifer Brunner, Lee Fisher to run for U.S. Senate". Associated Press. February 17, 2009. http://www.cantonrep.com/archive/x1802686467/Democrats-Jennifer-Brunner-Lee-Fisher-to-run-for-U-S-Senate. Retrieved March 27, 2009. ^ a b "Sherrod Brown". Washington Post. http://projects.washingtonpost.com/congress/members/b000944/. Retrieved March 27, 2009. ^ "Official USPS Abbreviations". United States Postal Service. 1998. http://www.usps.com/ncsc/lookups/usps_abbreviations.html. Retrieved March 26, 2009. ^ a b c d e f g h i j k "Ohio's State Symbols". Ohio Governor's Residence and State Garden. http://www.governorsresidence.ohio.gov/children/symbols.aspx. Retrieved March 26, 2009. ^ "Ohio's State Rock Song". Ohio Historical Society. July 1, 2005. http://www.ohiohistorycentral.org/entry.php?rec=1878. Retrieved March 27, 2009. ^ "Quick Facts About the State of Ohio". Ohio History Central. http://www.ohiohistorycentral.org/ohio_quick_facts.php. Retrieved July 2, 2010. "From Iroquois word meaning 'great river'"
^ Mithun, Marianne (1999). "Borrowing". The Languages of Native North America. Cambridge: Cambridge University Press. pp. 311–3. ISBN 978-0-521-29875-9. http://books.google.com/books?id=ALnf3s2m7PkC&pg=PA311. "Ohio ('large creek')"
^ "Native Ohio". American Indian Studies. Ohio State University. Archived from the original on February 2, 2007. https://web.archive.org/web/20070202230727/http://americanindianstudies.osu.edu/ohio.cfm. Retrieved February 25, 2007. 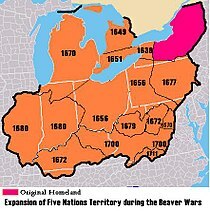 "Ohio comes from the Seneca (Iroquoian) ohiiyo’ 'good river'"
^ Harvey, Christopher. "Seneca". Languagegeek. http://www.languagegeek.com/rotinonhsonni/seneca.html. Retrieved February 25, 2007. ^ William M. Davidson (1902). A History of the United States. Scott, Foresman and Company. p. 265. http://books.google.com/books?id=G24AAAAAYAAJ&pg=PA265. ^ Berg-Andersson, Richard E. (2000). "The Math Behind the 2000 Census Apportionment of Representatives". The Green Papers. http://www.thegreenpapers.com/Census00/ApportionMath.html. Retrieved March 25, 2009. ^ a b Pollard, Kelvin (2008). "Swing, Bellwether, and Red and Blue States". Population Reference Bureau. http://www.prb.org/Articles/2008/electiondemographics.aspx. Retrieved March 25, 2009. ^ (February 12, 2003) "Transportation delivers for Ohio". Retrieved on December 22, 2005. .
^ "Ohio Coastal Counties". Retrieved on September 3, 2008. .
^ (1980) "Case law". .
^ "History of the Appalachian Regional Commission". Retrieved on January 3, 2006. .
^ "The History of the MCD: The Conservancy Act". Miami Conservancy District. http://www.miamiconservancy.org/about/conservancy.asp. Retrieved January 13, 2007. ^ "The Ohio Seismic Network". Retrieved on September 13, 2009. .
^ "Magnitude 4.0 – Youngstown‐Warren urban area, OH". Retrieved on December 31, 2011. .
^ "Ohio (USA): State, Major Cities, Villages & Places". City Population. February 19, 2011. http://www.citypopulation.de/USA-Ohio.html. Retrieved October 28, 2014. ^ "Religion and the Congress of the Confederation, 1774-89". Library of Congress. http://www.loc.gov/exhibits/religion/rel04.html. Retrieved April 11, 2012. ^ a b Blue, Frederick J. (Autumn 2002). "The Date of Ohio Statehood". Ohio Academy of History Newsletter. ^ Joint Resolution for admitting the State of Ohio into the Union, (Template:USStatute). ^ "State Nicknames – Nicknames of U.S. States". Geography.about.com. http://geography.about.com/od/specificplacesofinterest/a/statenicknames.htm. Retrieved July 2, 2010. ^ "Census of Population: 1970, Part 37 – Ohio, Section 1" (PDF). United States Census Bureau. 1970. http://www2.census.gov/prod2/decennial/documents/1970a_oh1-01.pdf. Retrieved March 27, 2009. ^ Balistreri, Kelly (February 2001). "Ohio Population News: Why did Ohio lose a seat in the U.S. House of Representatives?" (PDF). Center for Family and Demographic Research at Bowling Green State University. http://www.bgsu.edu/downloads/cas/file36222.pdf. Retrieved March 27, 2009. ^ a b "2000 Population and Geographic Centers of Ohio" (PDF). Ohio Department of Development, Office of Strategic Research. March 2001. http://www.odod.state.oh.us/research/FILES/G101.pdf. Retrieved March 26, 2009. ^ a b c d e f "Religious Composition of Ohio". The Pew Forum on Religion & Public Life. 2008. Archived from the original on March 6, 2008. https://web.archive.org/web/20080306022953/http://pewforum.org/religion08/state.php?StateID=10. Retrieved March 27, 2009. ^ "Jewish Population in the United States, by State". Jewish Virtual Library. https://www.jewishvirtuallibrary.org/jsource/US-Israel/usjewpop.html. Retrieved May 14, 2013. ^ "The Association of Religion Data Archives | State Membership Report". www.thearda.com. http://www.thearda.com/rcms2010/r/s/39/rcms2010_39_state_adh_2010.asp. Retrieved December 16, 2013. ^ a b c d e f g h i j "Economic Overview" (PDF). Ohio Department of Development. February 2009. http://www.odod.state.oh.us/research/FILES/E000.pdf. Retrieved March 31, 2009. ^ "ERS/USDA Data". Economic Research Service, United States Department of Agriculture. December 15, 2008. http://www.ers.usda.gov/data-products/county-level-data-sets/unemployment.aspx. Retrieved March 31, 2009. ^ a b "Ohio QuickFacts". United States Census Bureau. February 20, 2009. http://quickfacts.census.gov/qfd/states/39000.html. Retrieved March 31, 2009. 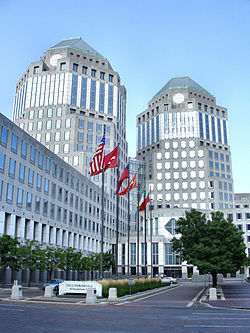 ^ "Fortune 500 2008". . May 5, 2008. http://money.cnn.com/magazines/fortune/fortune500/2008/states/OH.html. Retrieved March 31, 2009. ^ "Lottery Results" (SHTML). Office of Citizen Services and Communications, General Services Administration. http://www.usa.gov/Topics/Lottery_Results.shtml. Retrieved March 31, 2009. ^ "About the Ohio Lottery". Ohio Lottery Commission. 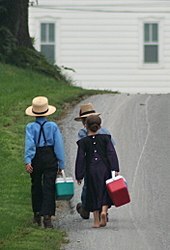 2008. http://www.ohiolottery.com/about/about_us.html. Retrieved March 31, 2009. ^ Kissell, Margo R. (March 24, 2009). "Englewood Man Wins $250,000 in Lottery". Englewood, O.H. : Dayton Daily News. http://www.daytondailynews.com/n/content/oh/story/news/local/2009/03/24/ddn032409lotteryweb.html. Retrieved March 31, 2009. ^ Vitale, Marty (May 29, 2014). "Report to SCOH" (Office Open XML). Louisville, Kentucky: Special Committee on U.S. Route Numbering, American Association of State Highway and Transportation Officials. http://route.transportation.org/Documents/USRN%20Report%20May%2029%202014.docx. Retrieved June 1, 2014. ^ a b c "Constitution Online". Ohio General Assembly. https://www.legislature.ohio.gov/laws/ohio-constitution?Part=3&Section=01. Retrieved March 25, 2009. ^ "Constitution Online". Ohio General Assembly. https://www.legislature.ohio.gov/laws/ohio-constitution?Part=4&Section=01. Retrieved March 25, 2009. ^ "Constitution Online". Ohio General Assembly. https://www.legislature.ohio.gov/laws/ohio-constitution?Part=2&Section=01. Retrieved March 25, 2009. ^ "Constitution Online". Ohio General Assembly. https://www.legislature.ohio.gov/laws/ohio-constitution?Part=3&Section=15. Retrieved March 25, 2009. ^ "Constitution Online". Ohio General Assembly. https://www.legislature.ohio.gov/laws/ohio-constitution?Part=3&Section=01b. Retrieved March 25, 2009. ^ a b c "Constitution Online". Ohio General Assembly. https://www.legislature.ohio.gov/laws/ohio-constitution?Part=4&Section=04. Retrieved March 25, 2009. ^ "Ohio District Courts of Appeal". Ohio Judiciary System. http://www.supremecourt.ohio.gov/JudSystem/districtCourts/. Retrieved March 25, 2009. ^ "The Supreme Court of Ohio Jurisdiction & Authority". The Ohio Judicial System. http://www.supremecourt.ohio.gov/SCO/jurisdiction/default.asp. Retrieved March 25, 2009. ^ "Constitution Online". Ohio General Assembly. 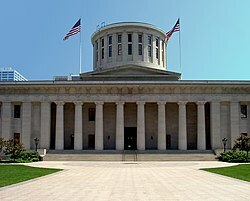 2009. https://www.legislature.ohio.gov/laws/ohio-constitution?Part=4&Section=02. Retrieved March 25, 2009. ^ "Ohio General Assembly". Ohio History Central. July 1, 2005. http://www.ohiohistorycentral.org/entry.php?rec=2126. Retrieved March 25, 2009. ^ "Government". Congressman Michael Turner. http://turner.house.gov/District/Government.htm. Retrieved March 25, 2009. ^ a b Ann Heinrichs (January 1, 2003). Ohio. Capstone. p. 42. ISBN 978-0-7565-0316-1. http://books.google.com/books?id=VTnyaU2WkmUC&pg=PT43. ^ a b c d e f "Graphic: Donkey Stampede". Columbus Dispatch. August 22, 2008. http://www.dispatchpolitics.com/live/content/local_news/stories/2008/08/22/demgraphic.html?adsec=politics&sid=101. Retrieved March 29, 2009. ^ "President / Vice President: November 4, 2008" (ASPX). Ohio Secretary of State. November 4, 2008. http://www.sos.state.oh.us/SOS/elections/electResultsMain/2008ElectionResults/pres110408.aspx. Retrieved March 29, 2009. ^ Hallett, Joe; Mark Niquette; Jonathan Riskind (November 6, 2008). "Total-state Approach Aided Obama". Columbus Dispatch. http://www.dispatchpolitics.com/live/content/local_news/stories/2008/11/06/copy/howwin.ART_ART_11-06-08_A1_4KBQDF8.html?adsec=politics&sid=101. Retrieved March 29, 2009. ^ Riskind, Jonathan (December 24, 2008). "Ohio likely to lose 2 seats in Congress in 2012". Columbus Dispatch. http://www.dispatchpolitics.com/live/content/national_world/stories/2008/12/24/ohcong.ART_ART_12-24-08_A6_0ACB253.html?sid=101. Retrieved March 29, 2009. ^ Brady, Jessica (November 6, 2008). "Democrats Gain in Michigan and Ohio". Roll Call. http://www.rollcall.com/issues/54_54/politics/29901-1.html. Retrieved March 29, 2009. ^ Nash, James (December 7, 2008). "Kilroy is Headed to Congress". Columbus Dispatch. http://www.columbusdispatch.com/live/content/local_news/stories/2008/12/07/election.html?sid=101. Retrieved March 29, 2009. ^ "Senators of the 111th Congress". United States Senate. http://www.senate.gov/general/contact_information/senators_cfm.cfm?State=OH. Retrieved March 29, 2009. ^ "Rep. Marcy Kaptur (D-OH) Urges Homeowners to Stay in Foreclosed Homes". Democracy Now. February 3, 2009. http://i1.democracynow.org/2009/2/3/rep_marcy_kaptur_d_oh_urges. Retrieved March 29, 2009. ^ "The Official Site of the Cincinnati Reds". Major League Baseball. http://cincinnati.reds.mlb.com/index.jsp?c_id=cin. Retrieved March 28, 2009. ^ "The Official Site of the Cleveland Indians". Major League Baseball. http://cleveland.indians.mlb.com/index.jsp?c_id=cle. Retrieved March 28, 2009. ^ a b "NFL Teams". National Football League. http://www.nfl.com/teams. Retrieved March 28, 2009. ^ "NBA.com Team Index". National Basketball Association. http://www.nba.com/teams/index.html. Retrieved March 28, 2009. ^ "NHL Teams". National Hockey League. http://www.nhl.com/ice/teams.htm. Retrieved March 28, 2009. ^ "Major League Soccer Teams". Major League Soccer. http://www.mlsnet.com/teams/. Retrieved March 28, 2009. ^ Griffith, Grant (2007). "Legend of the Cincinnati Red Stockings". Cincinnati Vintage Base Ball Club. http://www.1869reds.com/history/. Retrieved March 28, 2009. ^ "Ohio Attorney General". Ohio Attorney General. http://ohioattorneygeneral.gov/citizen/kids/ohio.asp. Retrieved July 6, 2009. ^ "Herb Capital of Ohio". Ohio Historical Society. July 1, 2005. http://www.ohiohistorycentral.org/entry.php?rec=1871. Retrieved March 27, 2009. This page uses content from the English language Wikipedia. The original content was at Ohio. The list of authors can be seen in the page history. As with this Familypedia wiki, the content of Wikipedia is available under the Creative Commons License.